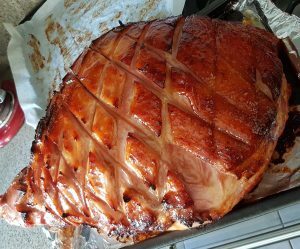 My family LOVES a baked ham at Christmas and I think they’d be tears if we didn’t have left overs. Prepare the ham by using a sharp knife to cut around the shank of the ham, about 10cm from the end. Run a knife under the rind around edge of ham. Gently lift the rind off in 1 piece by running your fingers between the rind and the fat (the fat stays on the ham). Score the fat in a diamond pattern, about 5mm deep (not into the meat). Cook for 20 mins per kilo occasionally basting with extra honey. Feel free to try other flavour variations for your families Christmas Baked Ham.